Review is up. You can find it and more over on my blog. Thank you Malwing. I am glad you enjoyed this and hope you enjoy the rest of the series. Thank you Malwing. I am glad you enjoyed and hope you enjoy the rest of the series. Well I got the the subscription so I'll be going through the whole thing. I'm highly anticipating Androids because I have a long scifi campaign coming up next month. 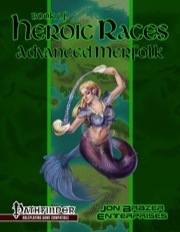 Just this morning, I was finishing up the mermaid section of the upcoming Book of Heroic Races: Occult Intrigue in the Wilderness. Almost ready.